The Michigan Court of Appeals said yesterday in a unanimous opinion that Tea Party candidates will not appear on the Nov. 2 ballot. Tea party members have said that the “Tea Party” that attempted ballot certification is bogus; some of the 23 candidates and petition signers could not be properly identified as legitimate. “The court, in a cryptic order released Monday afternoon, said the Tea Party failed to ‘strictly comply with the requirements of’ state election law in submitting 60,000 petition signatures to qualify its candidates for the ballot. “As a result, the Board of State Canvassers had no “clear legal duty” to certify the candidates as the Tea Party had requested, the court said. “The appeals panel was made up of Judges Michael Kelly, Patrick Meter and Donald Owens,” reports the Detroit Free Press. The Tea Party on Aug. 31 filed an appeal with the Michigan Supreme Court in The Tea Party v Board of State Canvassers, COA case no. 299805; MSC case no. 141694. They want “more autonomy, less bureaucracy, and a better quality of life.” But in Jill Priluck’s interesting perspective on why big firm partners are hanging their own shingles, there’s more to it than just being able to do things their way. Check out Slate.com for more. Over the weekend, Democrats and Republicans selected their candidates for the “nonpartisan” November judicial ballot. Republicans picked Justice Robert P. Young, Jr. and Wayne County Circuit Court Judge Mary Beth Kelly, who Young touted on his Facebook page as the “perfect choice” for the job. Democrats nominated newly minted Justice Alton T. Davis and Oakland County Circuit Court Judge Denise Langford Morris. We’ve got a straw poll on the Michigan Lawyers Weekly home page. Weigh in on which two of the four candidates should be taking seats on the high court bench come Jan. 1. Michigan Supreme Court justice Robert P. Young Jr. officially endorsed Wayne County Circuit Judge Mary Beth Kelly to be the GOP nominee to run against newly appointed justice Alton T. Davis. After careful consideration, I have decided to formally endorse JUDGE MARY BETH KELLY for the Republican nomination for Michigan Supreme Court. With the resignation of Justice Weaver yesterday, the people of Michigan have an even starker choice in November: continue with a solid liberal majority of judges or restore the Court by elec…ting two conservative Rule of Law judges. I believe that it is imperative to change the Court’s liberal majority and I believe that Judge Mary Beth Kelly is the perfect choice to run with me to take back the Court. Prior to Davis’ appointment, Young had urged his Facebook followers to support Court of Appeals Judge Jane Markey. Correction: Novi Lawyer pointed out in the comments that Young had mentioned both Markey and Mary Beth Kelly in prior Facebook posts. I had only seen Markey mentioned. Update: Young also appeared on Frank Beckman’s radio show on WJR-AM in Detroit. You can listen to the interview here. There’s a lot to be said about Gov. Jennifer Granholm’s appointment of Alton T. Davis to the Michigan Supreme Court following yesterday’s surprise resignation of Justice Elizabeth A. Weaver. He’s an experienced jurist with a 26-year career under his belt, the last five on the Michigan Court of Appeals. A list of his professional associations is long and impressive. His opinions, in my view, are fair, open-minded and well-written. He knows how to turn a phrase, when needed, to make his point. He looks judicial, and, it’s being said, he may have a calming influence on a sometimes braying and brawling Michigan Supreme Court. The bench, bar and Michigan citizens should be well-served. On the political side, if you’re a Democrat, you’re probably weeping with joy over this turn of events. If you’re a Republican, no amount of rubbing will ease the pain in your eye caused by the sharp stick Weaver just poked into it. With Davis’ appointment, Democrats have, at least for the moment, a 4-3 majority on the MSC. Davis will serve the remainder of Weaver’s term, which expires at the end of the year. It’s a cinch that he’ll emerge from the Democratic Party’s nominating convention this weekend as a candidate for his own, eight-year term. If so, he’ll have that all-important “Justice of the Michigan Supreme Court” designation on the November ballot. The incumbency designation is huge: historically, very few sitting judges lose at the polls. 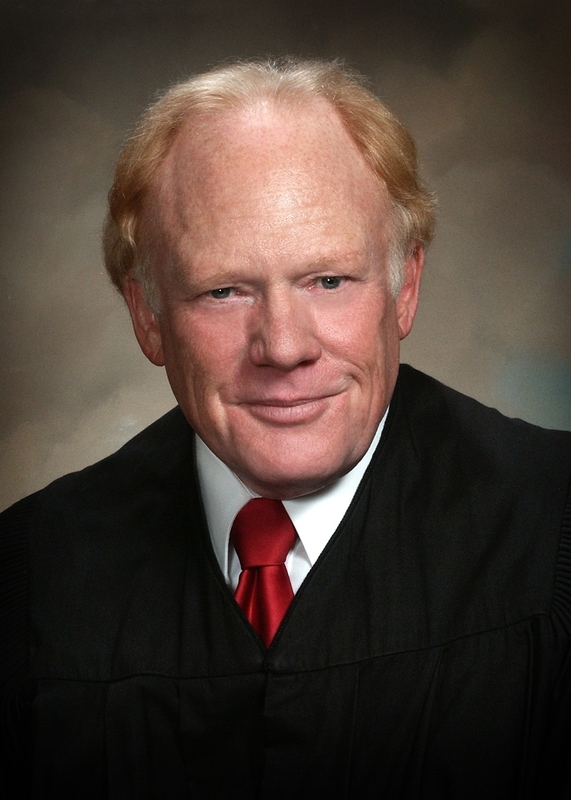 The Democrats, hoping to go two-for-two in knocking off sitting MSC justices, have been flinging mud at Justice Robert P. Young, Jr. since April, on the well-founded assumption that he’ll be selected at the Republican Party nominating convention, also being held this weekend. Both parties’ judicial slates for the “non-partisan” judicial ballot will be in place soon. Get ready for another ugly campaign season. Michigan Supreme Court Justice Elizabeth Weaver has made many headlines in her career. Her biggest one, however, is today’s news that she’s had enough, she’s calling it quits and Gov. Jennifer Granholm will name her replacement, most likely Court of Appeals Judge Alton T. Davis, says Detroit Free Press scribe Dawson Bell, at a noon press conference today. The Traverse City Record Eagle broke the story in this morning’s edition. Weaver’s retirement announcement come two days before state Democrats and Republicans huddle to select their picks for the “non-partisan” November judicial ballot.